Britain’s quirky towns and picture-postcard villages offer a perfect location for period dramas and blockbusters. Some towns have become iconic for hosting films such as Harry Potter and Notting Hill. Nothing can give you a greater insight into your favourite film or TV programme like exploring the location it was filmed. At Discover Britain’s Delightful Towns we want to help visitors enjoy different aspects that towns have to offer. 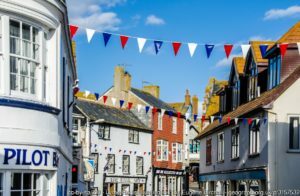 Filming location tours and special interest visits are popular in Britain’s towns and we hope this piece will help you to explore some unique towns. On the North coast of Cornwall sits Port Issac. 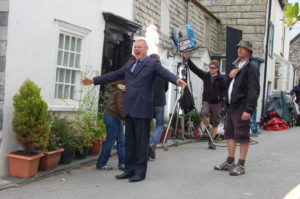 A small picturesque fishing village that plays the fictional village of Portwenn in the popular Doc Martin TV series. There are plenty of locations in and around the village that feature in the series and have now become hot spots for fans. Fern Cottage is easily accessible and is the most recognisable location, whilst also providing impressive views of the port and the village. The town of Alnwick famous for the second largest inhabited castle in Britain. The castle has been used numerous times as a filming location. Harry Potter and the Philosopher Stone and Chamber of Secrets is one of the more iconic films set in the castle. Alnwick castle provides events such as ‘Wizarding week’ to enhance the experience. 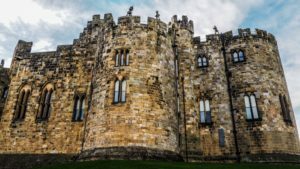 Alnwick has featured in more than just one film or series, others include: Robin Hood, The Hollow Crown, Downton Abbey, Transformers, and the first series of Blackadder The Black Adder (1983-4)! The small village of Lacock is nearly entirely owned by the national trust. Development has been minimal due to the loss of its wool industry. Lacock looks like it did nearly 200 years ago, making it an attractive location for period dramas and films. Lacock Abbey and a local cottage have been used as Harry Potter locations. 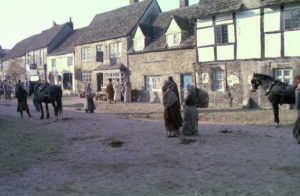 Also Lacock features in the film Pride and Prejudice, Meryton is the fictional town that Lacock plays part and presents the village perfectly. 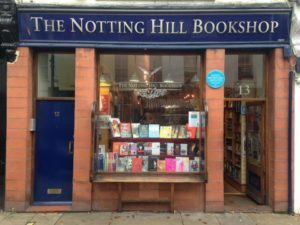 The vibrant area of Notting Hill is a district of London, popular for its colourful streets and bohemian cafes and restaurants. Notting hill Carnival is an annual event in the area that celebrates British Caribbean culture and is one of the largest street festivals in the world. Unsurprisingly the district is used in the film Notting Hill starring High Grant and Julia Robert. Explore the locations made famous by the romantic comedy with a self guided walking tour. Most self guided tours include the famous travel bookshop that features in the film. Along with plenty of hidden areas of Notting Hill. One of Britain’s major cities with a rich industrial past is Manchester. The northern city has played host to an array of films and TV series. 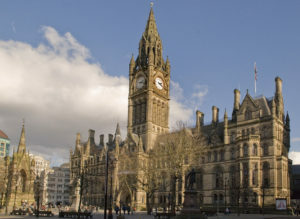 One of the most used locations is the iconic Manchester town hall. Films and series set in the building include: Sherlock Holmes, The Iron Lady, Crimson Petal and the White, Peaky Blinders, Last Tango in Halifax, Victor Frankenstein, Foyle’s War Series 8, The Making of a Lady and Ripper Street Series 3. The beautiful design of the building is a perfect filming location and a great place to visit while in the city. Retaining its historic charm, Corsham is something of a hidden gem in the county of Wiltshire. 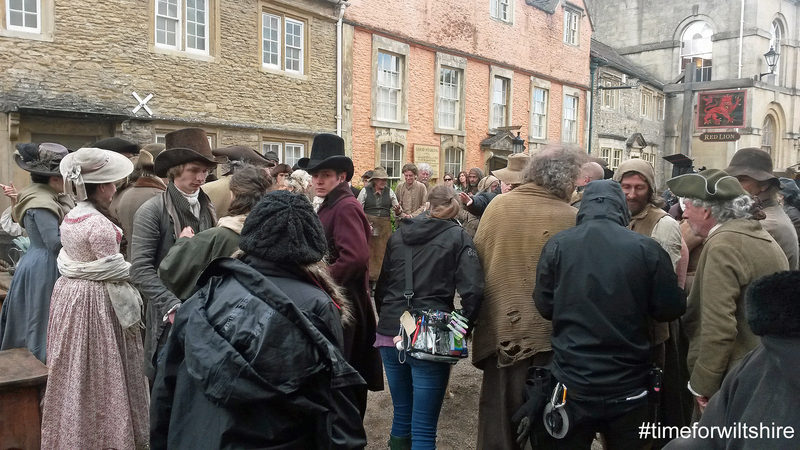 Recently thrusted into the spotlight, Corsham depicts the C18th Cornish port town of Truro in the TV series Poldark. However, Corsham is 150 miles away from Cornwall and very much inland. Chosen for filming due to the unspoilt architecture, the high street became the perfect location for Poldark. Other TV productions located in the town include: Merchant Ivory’s award-winning Remains of the Dayand Stanley Kubrick’s Barry Lyndon were both filmed at Corsham Court. Poldark attracts the most visitors these days with fans wanting to walk in the captains footsteps. Developed around the historic dockyard, Chatham is a medway town in the county of Kent. 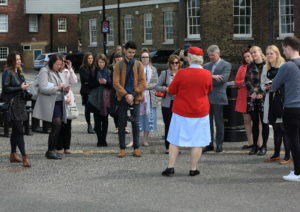 The dockyards host Call the Midwife official location tours. The tour offers props, costumes, and the set. A costumed midwife leads the 90 minute walk creating an immersive experience. The walking tour takes visitors around the historic dockyard and town, providing a great opportunity to learn about post war Britain. Thame, is a thriving market town in Oxfordshire. It is frequently used as a filming location for the hit ITV series Midsomer Murders. The town council provides a Midsomer Murders walking trail for fans visiting the town. The walk takes around 1 hour stopping at 21 filming locations in the town. 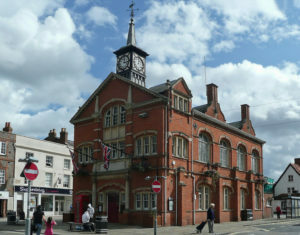 Many of the stops include the town’s iconic landmarks, the walk becomes a great way to explore hidden parts of the town. Midsomer Murders tours are also available if visitors want to learn more about the series and town. Known as the pearl of Dorset, Lyme Regis is famous for its location on the Jurassic coast. It continues to attract fossil hunters, who can head out with experts to search for their own piece of history. The town became a tourist destination in 1903 after the railway made its way to Lyme Regis. In 1980, a touch of Hollywood arrived in Lyme Regis. This was when ‘The French Lieutenant’s Woman’, starring Meryl Streep and Jeremy Irons, was filmed there. Follow The French Lieutenant’s Woman along the famous Undercliffs National Nature Reserve, which is nothing short of breath-taking. Following Ware Cliffs to the Undercliffs, you will find the most beautiful view of the Cobb. The quirky metropolis of Bristol has played host to some of TV’s most popular series. The city was the UNESCO city of film in 2017. It gained the status as a key player in the film industry and for its contribution to the culture of film-making. Popular series that have been filmed in Bristol are: Dr Who, Only Fools and Horses, The Young Ones, Casualty, Being Human, Broadchurch, Wolf Hall and the Casual Vacancy. 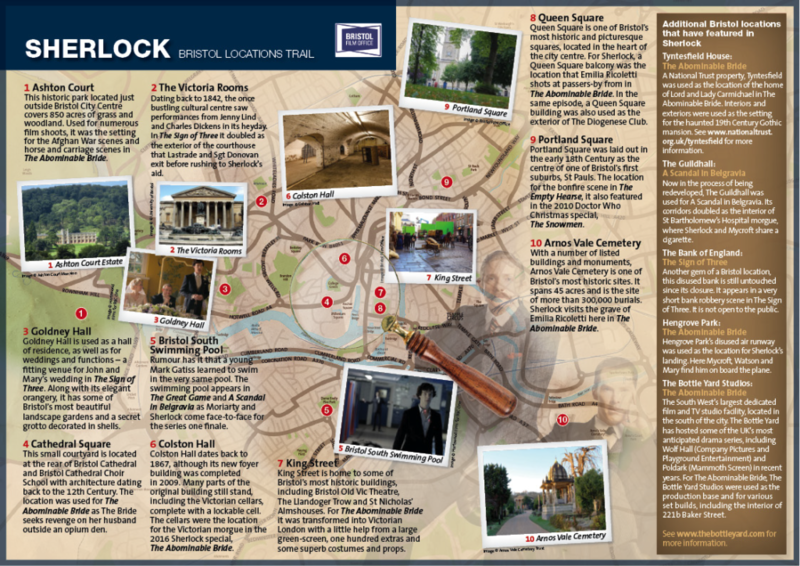 Visit Bristol has created detailed trails that visitors can follow such as the 10 Sherlock filming locations. Locations include some of Bristol’s most historic and picturesque areas and buildings.